going to happen for dinner. The week has been stressful - packed with meetings, deadlines, errands, and activities. When you finally get home it's tempting to pack up the car and head out to eat. This is pretty normal for a Friday night - de-stress after the week by getting out of the house and out of the kitchen for the night. But if you haven't had a chance to sit down around the dinner table and having a couple meals with the people you care about then make a commitment to do so during the weekend. Busy weeks are just the time to have healthy, homemade meals at home on Friday and Saturday nights. Making dinnertime matter is tough, but making sure you have a couple dinners together a week, even if it's on the weekend, can mean a lot. 1. It's healthy - The average restaurant or take out meal has over 60% more calories than a homemade meal. 3. It's smart - kids who regularly have meals with their family are 40% more likely to get As and Bs in school. So try a healthy, homemade meal this Friday night. 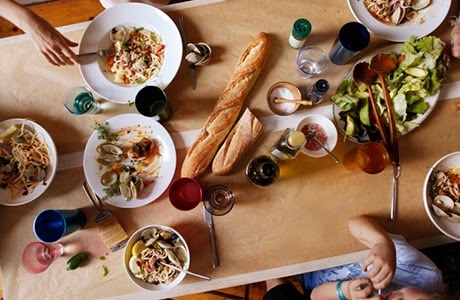 Let your own dinner table help with the stress of a busy week (chopping up onions or pounding out meat is always nice after a long week of work). And don't worry - we'll take care of the planning and shopping.